Valentine’s Day is this week and that means red, pink, and white will be plastered everywhere, chocolates in heart boxes will be flying off the shelves, the women will be expecting red roses from the men of their lives, and the kiddos will be buying Valentine’s to pass at school hoping to get one from their own crushes of the moment. With all of this influence of St. Valentine on our lives it is no surprise that everyone in the food and beverage industry will be coming up with the next best thing to serve for Valentine’s Day. Traditionally, my boyfriend and I always have strawberries so I wanted to incorporate strawberries in whatever I decided to make. I remembered an old icebox pie that included strawberries but it also included dreaded jello which I really don’t care to use since it leaves such an artificial taste. 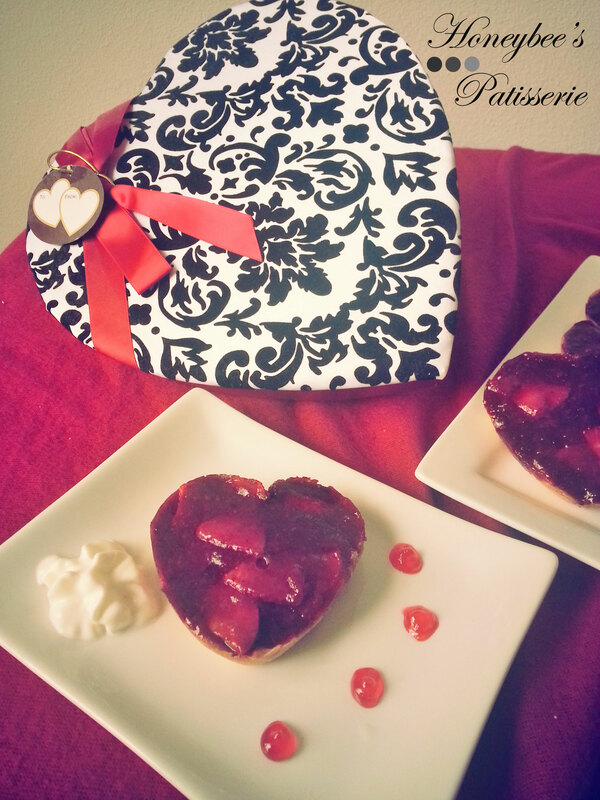 I ultimately decided to make the strawberry pie into mini heart shapes since I found a great deal on heart-shaped pans at a local market. 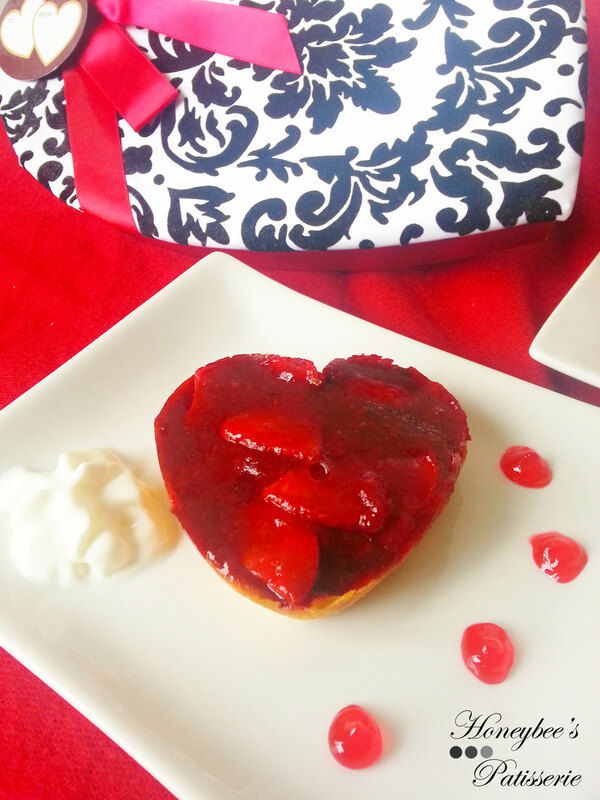 If you can’t find a mini heart pan you can always use a larger disposable heart-shaped pan that are often sold in major supermarkets this time of year or just a regular pie pan if you care to make it at a different time of year. Just be sure to double all of the recipe ingredients except for the pie crust if you do decide to make this into a larger size pan. The great thing about this Strawberry pie is not only the taste but it is a lot more cost effective than usual recipes involving strawberries. I used frozen strawberries and cooked them in a saucepan until they reduced into a thick, jam-like consistency that increased the quality of flavor but also allowed me to use less fresh strawberries, which are expensive. To thicken the filling so that it is the proper consistency and not too bouncy, unflavored gelatin is mixed with some lemon juice, which not only helps the gelatin thicken further but also perk up the flavor of the strawberries. With a little bit of sugar and salt this pie had supreme berry flavor at a budget friendly price and perfect to share with your honey on the big day. Note: This recipe makes 6 individual mini heart pies. If you elect to double the recipe and cook in a larger pie pan the recipe will serve 8 clean slices. To save time I use store-bought pie dough but you can certainly whip up your own if you have the time. Be sure to reduce the filling adequately (about 1 cup) otherwise it will be too lose and won’t set up in the refrigerator. If the fresh strawberries you purchase don’t look ripe enough, you may want to add a bit more sugar to taste. The pie is best served the day it is made but can be stored for up to 24 hours. Serve with a dollop of whipped cream. Press the pie crust into the individual heart cups of the pan. If the crust breaks, patch together with a dab of water on the finger and a gentle massaging motion to meld the dough back together. If using a traditional pie plate, unfold pie crust as described on the box or recipe. Bake the crust for about 10-15 minutes or until golden brown. Allow to cool. Cook the frozen strawberries in a large saucepan over medium-low heat. The berries will begin to release their juice. Increase heat to medium-high and cook, stirring frequently, until thick and jam-like, about 20 to 25 minutes. Combine lemon juice, water, and gelatin in a small bowl. Set aside and let the gelatin soften and thicken, about 5 minutes. Stir the gelatin mixture, sugar, and salt into the cooked strawberry mixture and return to a simmer for about 2 more minutes. Transfer the mixture to a bowl and allow to cool to room temperature, about 30 minutes. Using a spatula or spoon, fold the fresh berries into the cooled filling. Spread evenly into the cooked heart shells or pie shell and refrigerate until set, about 4 hours. Does it feel like 2013 is already flying by for everyone??? For myself it definitely has. I know the posts have been lacking in frequency lately but it has been a crazy past few weeks for me. I just recently gave birth to my first child at the end of January and it has been a whirlwind ever since. From the sleepless nights to family staying in the house for a visit, it has not been the ample environment for baking and blogging. Have no fear though… I did squeeze in some time for a quick little Valentine’s Day themed post since the holiday is fast approaching. Valentine’s Day is one of those holidays that… for most… can be controversial depending on your relationship status at the time. For me it has always been a good day despite my former single years. Although there was a time I hated the holiday more than I do now, I still always dreamed of the day I would be able to share it with someone who would appreciate me and appreciate spending such a day with me. Now I no longer have to dream of that day but actually get to experience it… so all those years of waiting were not in vain and I’m glad that I never looked at the holiday too sourly just because I may have been a bit bitter toward all the mushy stuff at the time. The recipe I present to you today is one that I made during those single years and have carried with me ever since. They are quick and simple which gives you ample time to spend with your sweetheart. Depending on the tastes of the ones your sharing these little bites with, you can either leave them plain, frost them, or add a little decal to the frosting for added character. I left some plain for my boyfriend since he doesn’t care for frosting and I frosted the rest with decals added to bring out the Valentine’s Day theme further. Besides using pink frosting and heart decals for a Valentine’s theme, I also used a small heart cookie cutter to cut the cooled brownies into a fitting shape. With that said, you can make these brownie bites for different holidays in the future by using alternative shapes or simply cutting them into squares for everyday munching. I am going to provide a formula for the brownies, however if you really want to shortcut the process and need to make these brownies in a jiffy, you can use a box brownie mix, plain fudge or double fudge recipes only, and follow the package instructions for preparation. Once the batter is prepared, pour half in the pan, cover with peppermint candies, then spread the remaining batter over top and bake as directed. I don’t recommend as from scratch is always better and doesn’t have that synthetic artificial taste but it is always great to have a quick go to method for emergencies which is why I will still mention it as you never know when you may need to prepare something and be short on time. I couldn’t be more aware of that now with having a newborn in the house of a baker. Adjust the oven rack to its middle position and heat to 350°. Line an 8 inch square baking pan with foil and be sure to leave an overhang of about 1 inch on all sides. Melt the butter and chocolate together over a double boiler. Set aside to cool slightly. Combine the flour, baking powder, and salt in a bowl. Whisk the sugar and eggs together in a large bowl. Add the vanilla and slightly cooled chocolate mixture into the egg mixture. Gently fold in the flour mixture until just incorporated. Pour enough batter to generously cover the bottom of the pan. Spread the batter evenly and tap on a hard surface to remove any air bubbles. There should be about 1 cup of batter remaining to pour on top. Arrange the peppermint patties over the smoothed batter. Be sure to leave about ½ in. between each piece. Pour the reserved batter over the peppermint candies and smooth. Bake the brownies until just set in the center, about 30 to 35 minutes. Cool completely in the pan set on a wire rack for approximately 2 hours. Once cooled, grab the foil overhang and lift the brownies from the pan. Place the brownies on a cutting board. Choose a cookie cutter shape and carefully arrange and cut out the brownies in your desired shape making sure to strategically plan out your placement of the cutter to maximize the amount of shaped brownies you will receive. Once cut, you can leave the shapes plain or frost them with a flavor and color of your choice. Brownies can be stored at room temperature for 3 days. Although I am a day late…Happy Valentine’s Day everyone!!! What can I say I had an epic time with my amazing boyfriend Peter. It was a relaxing day in the house. I baked, he helped me take these photographs for the blog, we exchanged chocolates, we ate New York style pizza with mushrooms and extra cheesy goodness, played video games together… it was simplistic but fun. We will certainly be going out this weekend for a more formal dinner but to me I was happy nonetheless. I hope all of your Valentine’s day wishes were granted and this quick and easy formula for Pink Azalea Mini Cakes may just make your day that much brighter. 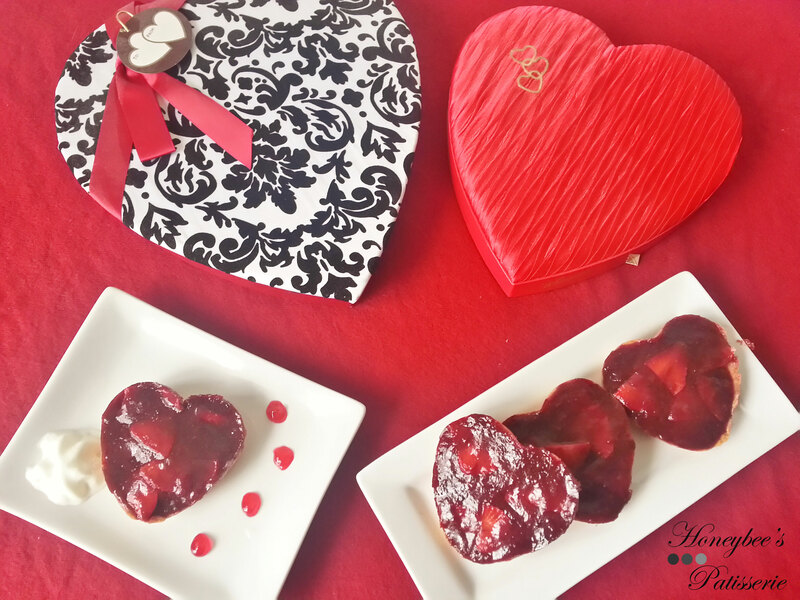 Although I made them with Valentine’s Day in mind, they can be made for any occasion…Anniversaries, Wedding Favors, Birthdays, or just when you feel like cake but don’t have the energy or time to spend on a large one. Although the images you see first are the cupcake version, they still taste as decadent as if they were a mini personal cake. I did prepare a traditional version of the mini personal cakes but for some reason I was most proud of the cupcakes. They are so simplistic yet elegant and especially for a holiday, you want something that is easy to travel with and something small to share with your loved one after you have already more than likely consumed a large formal dinner. To begin this formula, whether you elect to make all mini cakes or one mini cake and use the remaining batter for cupcakes (as I did), you must first prepare a white cake batter. Depending on your time or skill level, you can either prepare the white cake batter from scratch or use a boxed caked mix. Once the batter is prepared you must divide it, as one batter will be pink and have added ingredients while the other will remain white without external flavor additions. To prepare a mini cake and cupcakes as I did, first fill your mini cake pan with the plain white cake batter. Then mix in chopped strawberries, chopped pecans, and red food color into the remaining batter and fill another mini cake pan of the same size. With the remaining batter, fill cupcake tin lined with 12 wraps. If you elect to make only mini cakes, then you can fill two mini cake pans with plain white batter and two with the pink batter. As the cake layers bake, prepare your favorite frosting. My favorite for this particular cake is Chantily Cream as it is light and airy much like the cake is and you don’t want something overly sweet like a traditional buttercream frosting as it is too heavy and will distract from the flavors. Of course if buttercream is your favorite don’t hesitate to prepare it but be sure not to add any external flavors. Keep the only additional flavoring to vanilla, just like I did with the Chantily Cream. Once you prepare your favorite frosting, add a few drops of red food color until it takes on a light pink hue. For added decor, fan some strawberries or slice them and arrange them in the shape of a heart or a simple slice to add height, flavor, and interesting texture. What’s not to love about strawberries on Valentine’s Day!!! Once the cake layers have had ample time to cool, fill a pastry bag fitted with a mid-sized star tip (#842) with your choice of frosting and set aside. Trim the cake layers and cut each in half. Place one white cake layer on a turntable cover with frosting. Place the pink cake layer on top and layer again with frosting. Place the final white cake layer on top and cover the top and sides with frosting, making sure the cake layers do not show through and the frosting is smooth. Gently press chopped pecans along the base and pipe shells along the top edge. Pipe a rosette on the top of the cake in the center and place a fanned strawberry on the rosette to complete the mini cake look. For the cupcakes, pipe your frosting in a circular motion, making sure to cover the entire surface of the cupcake. Build up the frosting a bit in the center. Place your choice of adornment, whether a fanned strawberry, single strawberry slice, or strawberry slices shaped into a heart, in the center of the cupcake. Whichever method you choose, whether mini cakes are you fancy, cupcakes, or both, you are sure to please your Valentine and have great memories to share for a lifetime. 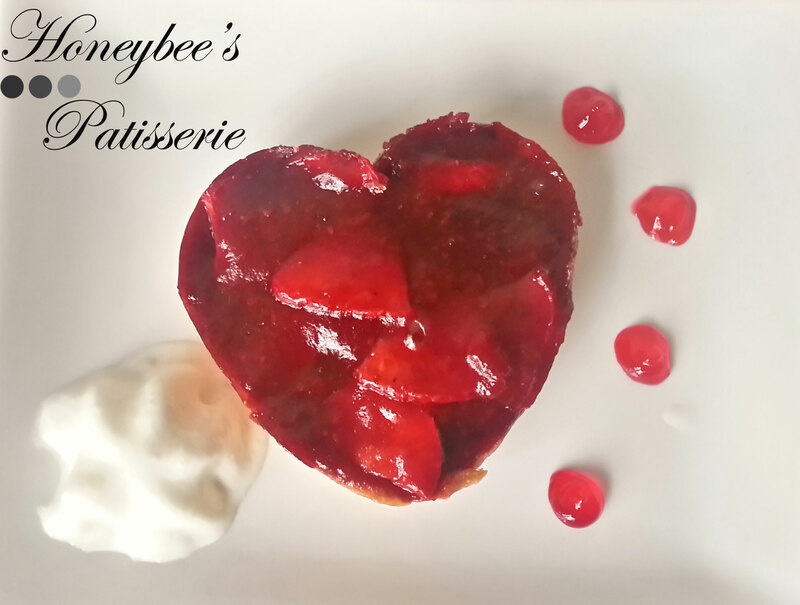 Happy Valentine’s Day to you and yours… from Honeybee’s Patisserie!!! Adjust oven rack to middle position and preheat oven to 350°. Prepare batter for a white cake or follow box directions for a white cake mix (be sure not to bake the batter according to box directions). Grease and flour two mini cake pans and line a 12 slot cupcake pan with paper cups if making 1 mini cake and cupcakes. 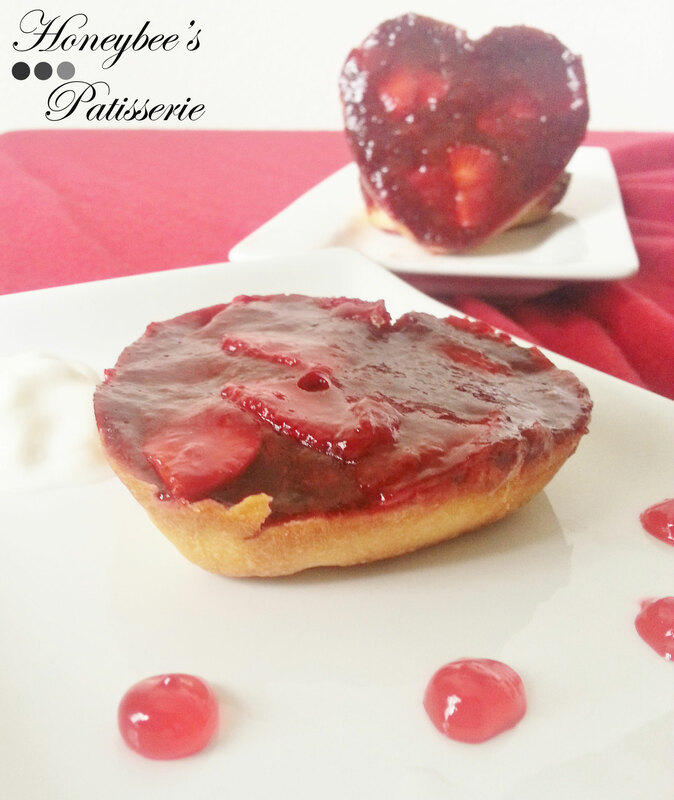 If preparing only mini cakes, grease and flour 4 mini cake pans. If making only cupcakes, line two 12 slot cupcake pans with paper cups. Fill one mini cake pan with plain white cake batter if making only one mini cake. If making two mini cakes, be sure to fill two pans with plain white cake batter before proceeding (VERY IMPORTANT). With the remaining white cake batter, mix in a few drops of red food coloring until the batter turns a pink hue. Gently fold in the chopped strawberries and pecans. If making one mini cake, fill one mini cake pan with pink batter. With the remaining pink batter, fill the cupcake pan, making sure each tin is filled ¾ full (12 cupcakes in all). If making only mini cakes (no cupcakes), fill two mini cake pans with the pink batter. If preparing only cupcakes, mix the red food color, pecans, and strawberries into all of the prepared white cake batter. Do not reserve any plain batter. Pour the pink batter into the prepared cupcake pan and bake for about 18 minutes. For the mini cakes, bake for about 20 minutes. Allow the cake layers and cupcakes to cool in their pans for about 10 minutes. Once slightly cooled, remove the cakes from the pan and allow to cool completely on a cooling rack. As the cakes cool, prepare the frosting. Once cooled completely, fill a piping bag fitted with a star tip with your desired frosting tinted pink with red food color (Chantily Cream was used here). If making only cupcakes, pipe around the surface of the cupcake with your choice of pink frosting and top with a fanned strawberry or strawberry slices. If also preparing a mini cake or only mini cakes, set aside the piping bag. Trim the tops of the mini cakes level and cut each in half. You should have two layers of white and two layers of pink. Lay the white layer down first and cover with an even layer of pink frosting. Lay the pink layer next and cover with an even layer of pink frosting. Lastly, top with another white cake layer and cover the entire top of the cake and sides with pink frosting. Be sure to smooth the frosting before proceeding to the next step. Once smoothed, gently press chopped pecans along the bottom of the cake to create a nut border. With the reserved piping bag, pipe shells along the top, outer border of the cake. On the top of the cake in the center, pipe a single rosette and place a fanned strawberry on the center of the rosette. If desired, sprinkle some chopped pecans around the fanned strawberry. Combine cream and sugar in a large bowl. Whip until soft peaks form. Fold in vanilla.